Turkey is to budget backpackers what butter is to toast. Pretty damn essential. A country three times the size of the UK, Turkey has a lot to offer travellers looking for exciting things to do and see on the cheap. Let’s take a look at what’s going on in one of Europe’s most thriving tourist economies. The Turkish capital is a haven for people looking to travel abroad on the cheap and has a lot to offer from sights, to sounds and even killer street food. One of the best and cheapest things to do from any of the�cheap hotels in Istanbul�you happen to be staying out of? Crossing continents. Head to Taksim square, jump on a dolmu?�(type of shared minivan) and head across Bosporus bridge and you’re almost there. Disembark at�Kad?k�y and you’ll see the “Welcome to Asia” sign that demarcates you have indeed travelled between two continents all within the price of 4 Euro. Not bad at all. Wait, you thought you had to be rich to hang out on a yacht and dive into the warm waters of the�Mediterranean? Not so in Turkey. Budget backpackers will be glad to know they can head down to the coast in Fethiye and set aboard a gullet (Turkish boat). Head between early spring and you’ll get the best weather and prices. Check out tour companies around the area or online beforehand for the best deals. Once the site of the ancient city Halikarnassus, Bodrum has now evolved into one of the busiest tourist spots in the whole of Turkey. It’s not hard to see why. Full of ancient historical ruins, modern museums packed with artifacts and treasure and many great restaurants all help to keep Bodrum busy. For the budget traveller however it’s probably the beach that offer the most bang for the buck after dropping a few pieces of green for stay in�hotels in Bodrum. Stretching between castle and the�mausoleum�of Halikarnus, the beach offers long stretch of sand that is great to set up camp on and go for a dip. Nearby you’ve got the Hamam Turkish baths and the floating beach club of Aquatica to kick up a storm in. 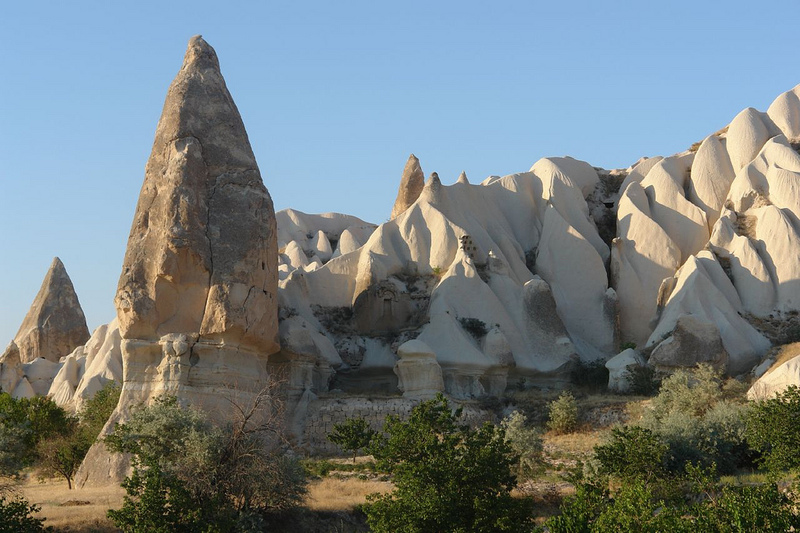 The volcanic landscapes of Cappadocia have long interested the visitors that come to Turkey. Something�reminiscent�of the rocky outcrops of Utah, the caves and crevices of�Cappadocia offer a pretty other-worldly experience for backpackers straying out this far. Using�G�reme as a base, you can perhaps pip for a stay in one of the cave hostels and hotels themselves while saving money and strengthening your budget by hiring a scooter. This kind of mobility means that you can see the key sights, like Pigeon Valley and the Underground City, at your own pace and without the expense you’d shell out for being on a tour. Turkey truly is a great place for the budget backpacker and has plenty to see and do for people of all interests. Using some of these smart little tips you’ll probably have plenty left over to enjoy some other Eastern European destinations too.